The next two chapters describe in detail how to create property paths. This section briefly introduces virtual property paths for XML virtual documents. As noted earlier, you can use schema-dependent paths only if you have loaded the corresponding XML schema. You can always use DOM-style paths, even when no schema is available. Where unit1 is the name of a child XML element in the document, unit2 is the name of a child element within unit1, and so on. The leaf unit is the name of either a child XML element or an XML attribute. Each path unit has the following form. Where namespace_identifier represents the XML namespace; this is a token that Ensemble replaces with the actual namespace URI, as discussed in a later subsection. This token is needed only if the element or attribute is in a namespace, as you will see later in this chapter. name is the name of an XML element or attribute. When you load a schema into Ensemble, Ensemble establishes a set of tokens for the namespaces used in that schema, for use in any DOM-style paths. The token $1 is used for first namespace that is declared in the schema; this usually corresponds to the XML schema namespace (http://www.w3.org/2001/XMLSchema). The token $2 is used for the next namespace that is declared in the schema, $3 is used for the third, and so on. Ensemble assigns namespace tokens for all namespaces declared in the schema, whether or not those namespaces are actually used. Therefore, Ensemble might use $3 or a higher value rather than $2 for the items of interest to you, if additional namespaces are declared in the schema. It is practical to use the Management Portal to view the individual path units, as discussed in the next section, to be sure that you are using the correct token for a specific path unit. You can use namespace tokens if you have also loaded the corresponding schema (and have configured the applicable business host to use that schema). Otherwise, you must use the namespace prefixes exactly as given in the XML document. Until you are familiar with property paths for XML virtual documents, it is useful to use the Management Portal to view the individual path units. You can do this if you have loaded the corresponding schema. Load the schema as described in the previous chapter. Click Ensemble > Interoperate > XML > XML Schema Structures. This displays the XML Schemas page. The left column lists XML schemas loaded into this Ensemble namespace. 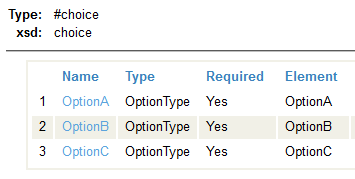 Click Category link in the row corresponding to the XML schema of interest. Click the link for the document type of interest. Above the table, the value in large font displays the DocType value for this XML element. In this case, DocType is MyApp:Patient. The Name column shows path units in the format needed for schema-dependent paths. In this case, this page tells us that we can use Name, FavoriteColors, Address, Doctor, MRN, and DL as path units in schema-dependent paths. The Element column shows path units in the format needed for DOM-style property paths. In this case, this page tells us that we can use $3:Name, $2:FavoriteColors/$2:FavoriteColor, $2:Address, $2:Doctor/$2:Name, @MRN, and @DL as path units in DOM-style paths. Notice that @MRN and @DL do not have a namespace prefix; these attributes are not in any namespace. Click additional sub-items as wanted. This page displays any additional path units within Address. The following sections note specific variations due to schema variations. The <FavoriteColors> element contains a sequence of multiple <FavoriteColor> elements. On the schema viewer page, <FavoriteColors> is shown simply as FavoriteColors() in the Name column (which shows the path unit for schema-dependent paths). This column is displayed in blue in the following figure. In contrast, the same element is shown as $2:FavoriteColors/$2:FavoriteColorsItem in the Element column on the right. This column shows the path unit for DOM-style paths. For a sequence of multiple items of the same type, the schema-dependent path does not use the name of the inner element. (In contrast, the DOM-style path uses all the element names.) More generally, any redundant inner levels found in a schema are ignored in schema-dependent paths; the following item shows another example. The <Doctor> element includes a single <Name> element. 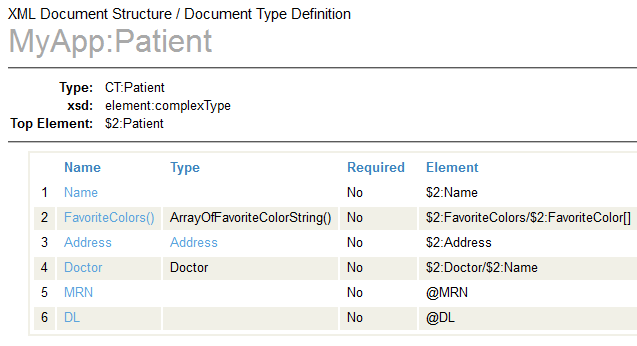 On the schema viewer page, the <Doctor> item is shown as Doctor in the Name column, as shown in the previous figure. Notice that the schema-dependent path to the data inside <Doctor> does not use the name of the inner element. In contrast, the same item is shown as $3:Doctor/$3:Name in the Element column on the right. This column shows the path unit for DOM-style paths. If a given element can occur multiple times, the Name column displays parentheses () at the end of the element name. For example, see the FavoriteColors() row in the preceding figure. The Type and Element columns indicate the number of times the element can be repeated. In this case, the element can be repeated five times. If there is no number displayed in parentheses in the Type column, the element can be repeated any number of times. Similarly, if the schema has multiple elements at the same level but in different namespaces, then Ensemble appends _2, _3, and so on, as needed to create unique names at that level. This procedure applies only to the schema-dependent paths. For schema-dependent paths, the Name displays a generic name for the <choice> structure, and the Type column displays a numeric placeholder. The Element column does not display anything. 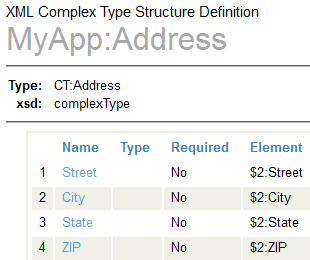 For schema-dependent paths, the Name displays the name of the group, and the Type column displays a numeric placeholder. The Element column also displays the name of the group.